Like an increasing amount of people, I've discovered I'm in a love-hate relationship with my phone. And, just as with any meaningful bond, there are good elements – most recently, watching the World Cup through the eyes of Twitter, having group chats fly wild and free during terrible reality TV shows and FaceTiming friends in faraway lands. And there's also bad elements, and dealing with the uglier side of being tied to your phone. When you get into bed and take one last look before sleeping, only to realise you have five WhatsApp conversations to attend to, 78 Slack messages to catch up on and Facebook, Instagram and Twitter all pleading for attention like a needy toddler, it's natural to feel overwhelmed. Smartwatches, in all their shining glory, have offered a way to leave your phone in your pocket and filter out some of this noise, but they also aren't for everyone, and can sometimes create more screen time in of themselves. It's why San Mateo startup Sucint Inc. wants to help push your phone into the background in a more targeted way, all while still keeping you in the loop for the important stuff – calls from your significant other, messages from parents, and anything else you might prioritise responding to in real-time. The company's clip-on wearable, Paigey, is currently up for funding through Kickstarter, and available from around $44 before shipping to backers this December. "The idea was really inspired by my wife," Sucint founder Alejandro De La Fuente told Wareable. "It's a bit of a cliché, but everybody knows somebody that never answers texts. And my wife has always been one of those people, but she’s also just incredibly busy, too – whether it was work or through looking after our kid. Like a lot of women, she would also have her phone in her bag, and she would never get to it. "And when I saw her always being frustrated about that, it got me thinking. It was around the time when the Apple Watch came out, and it was one of the first compelling wearables for women. And one of the reasons it's compelling, really, is because of how we use our phones – you need to attend to your phone, and for women, especially, that isn’t sometimes easy. You don't have to do that with a wearable. "So to help solve the problem, I thought I’d get her a smartwatch. But she didn’t want one, because most of the options at the time were ugly. Or, with the Apple Watch, she didn't like the fact that it had to replace her regular watch. For her, she felt like that was too much of a fashion commitment." After trying multiple fitness trackers, along with other wearables that promised notification support, De La Fuente and his wife, Ryan, along with four other members of the Sucint team, began creating a clip-on device to help clear up the problem. Instead of missing important calls because a phone is lying in a bag, as research suggests it often does for women, or feeling hassled by too many vibrations in your pocket, Paigey clips onto a bra or belt, allowing the user to pick and choose when they're notified through a light, customisable buzz. Whether it's specific apps, people, calls or texts, the crux of the device is handing the wearer control over how much or how little they're pulled into their phone. "People don't necessarily want to have to learn to use another piece of technology, or even just charge another piece of technology. There’s still a lot of tech that aims to help us and make us more efficient, but actually creates more issues. I wanted Paigey to be about disappearing into the background. "We also wanted to prioritise comfort, but obviously this thing has to be super reliable when it comes to just clipping on. Initially, I had ideas about a metal clip, but after a lot of trialling it with different people, different bodies and different clothing, we realised you really need an elastic band-style design to make it work consistently. "But, even within that, tuning the aspect ratio of the device has probably been the biggest challenge – if it’s too long it’s uncomfortable, and if it’s too short it can flip around too easily. By making the edges curved through later iterations and refining the clipping mechanism, mainly, we’ve hit on something that you can yank and it still won't come off," De La Fuente continued. With De La Fuente's background in electrical engineering, and having spent years working within the area of flexible electronics through HP Labs in Bristol, England, the founder has plenty of experience within the field, and it runs far deeper than just the last few years and the ones to come. "We have a young child, and we think a lot about how she interacts with technology. But the fact that Google has its Digital Wellbeing coming out and Apple is starting to group notifications through Screen Time, I genuinely do believe that these companies do want smartphone engagement to be a bit more meaningful. There’s obviously a commercial struggle within that, so it’s almost surprising to see how much they are doing, but we think Paigey is a good complement to limit that screen time," he said. There's no question that Paigey presents a solution to a problem that more and more people are coming to terms with. And while it's certainly not a wearable that prioritises packing in features, like we so often see, this actually, in a way, adds to its appeal. 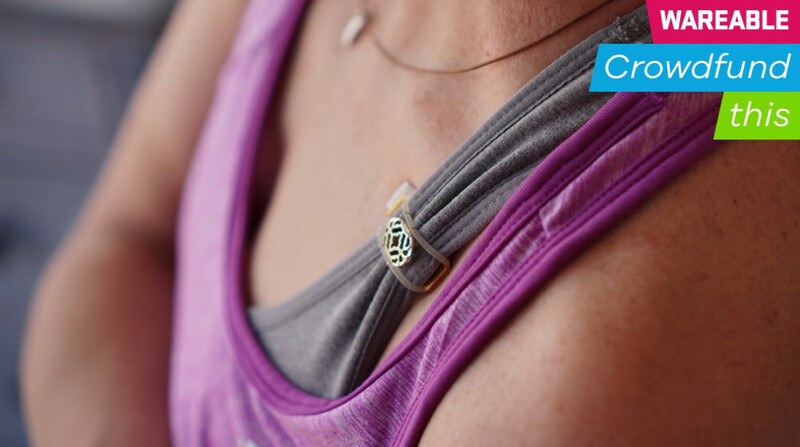 It may seem like technological juxtaposition at this point to add another device and expect less interaction, but the signs are encouraging that Sucint has created a clip-on wearable that can achieve just that. Even more positive is De La Fuente's experience within the field. By building a Thailand factory for a previous venture, the founder is already familiar with the manufacturing process, and also indicates the app is already close to completion. And because of this, the signs do point to this being a campaign you can back with confidence, which can't necessarily be said for all. There's naturally still an element of risk attached to any crowdfunding project, as we routinely point out, but for anybody who wants to wrestle back control over their relationship with their smartphone, this is one wearable that's worth exploring.